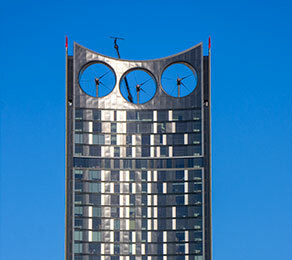 Strata is the first building in the world to have three integral wind turbines, each nine metres in diameter, which are housed in the 20-metre section at the top of the tower. CCL was commissioned to undertake the specialist post-tensioning design. The objective was to create a flat soffit within minimal floor-to-floor heights whilst maintaining an optimal slab thickness. The use of post-tensioning made it possible to achieve long spans with difficult plan geometry (floor curvature), maintaining a structural depth of 200 mm on spans of up to nine metres. This slab depth would have proved impossible using traditional reinforced-concrete construction methods. Also included in the design was a stage-stressed transfer beam at level two of the Pavilion. This was used to provide deflection and crack control as construction continued above, whilst minimising structural depth and headroom implications. When compared to traditional construction methods, CCL’s post-tensioned slab design resulted in a reduction of 50 – 75 mm of concrete per floor. This saved approximately 2000 m³ of concrete within the superstructure alone (760 tonnes of CO2), equivalent to an additional floor within the same building envelope. CCL’s post-tensioned design achieved cost reductions of more than 15 per cent, whilst additional savings were made because of the rapid construction schedule (just over one floor per week), and the use of climbing screens and a formwork hoist.